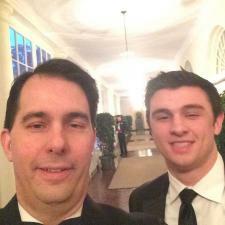 Maybe Walker should consult with Sarah Palin about marijuana before shooting his mouth off. Last week, Scott Walker appeared at a luncheon in Phoenix, which was emceed by Hugh Hewitt. When he wasn't talking about how the Boy Scouts made him presidential material, he discussed whether to legalize marijuana. At a luncheon in Phoenix emceed by conservative radio host Hugh Hewitt, Walker said he opposed legalizing marijuana, citing a conversation he said he had with the sheriff of liberal Dane County. "I mean, it’s left of Pravda," Walker said of the political views of county residents, which he compared to the Communist Russian newspaper. "Even there, the Democrat sheriff said to me last year when this issue came up, 'Whatever you do, please do not sign the legalization of marijuana,'" Walker said. "This was a guy who spent his whole career in law enforcement. He was liberal on a whole lot of other issues. But he said it’s a gateway drug." Sheriff Dave Mahoney said Monday he had no recollection of such a conversation. In fact, Mahoney said, he has never had a one-on-one, sit-down conversation on any topic with Walker since he became governor. Any interactions they've had at public events and meetings have been cordial small talk, he said. "I'd be very interested in knowing when I had a conversation with the governor himself about marijuana," Mahoney said. "I have no idea when that could have possibly occurred." Mahoney said he participated in one meeting in the governor's office as a member of a lobbying committee of the Badger State Sheriffs' Association where the group expressed opposition to marijuana. However that was more than a year ago and the governor was not present, Mahoney said. Even something as simple as saying he is opposed to legalizing marijuana is more than Walker can do. He has to lie about it. There is no logical explanation for it. Perhaps he needed a scapegoat for when this backfires on him. After all, 23 states and the District of Columbia have already legalized pot in some fashion. Or maybe, just maybe, Walker is a compulsive liar. Or maybe Walker just needs to light up and loosen up a bit.